Team THHN enjoyed a fantastic Superstars event, organised by our great friends at Peak Performance Gym Torquay last month. It was fabulous fun for all concerned where competitors took part in a number of different events including sprints, relay races, tag rugby, five-a-side football, basketball and a tug of war. The day started at Exeter Arena and finished at Torquay Boys Grammar School. Thank you so much to everyone who got involved either by joining in or helping to organise the event. The money raised was specifically to help send two families to Euro Disney for Christmas. This is one for all budding young artists. This December we’re running a competition for children to design a very special Christmas card for us to have printed and use next year. We’re looking for children from Reception to Year 6 to come up with a design that they think represents Torbay. Any of you who regularly read our newsletters or follow us on Facebook or Twitter will know about the amazing support we get from local children. They seem to be inspired by the children we provide holidays for and put amazing amounts of time and effort into helping us raise money. So, this time we thought it would be nice if we encouraged a bit of creativity and we’re hoping for great things. Not only will the winning designs be made into Christmas cards next year but there are also prizes to be won. Everyone who enters will be in with a chance to win a trip to Babbacombe Model Village for their entire class and the child who creates the winning design from their year group will also get to take their class for a fantastic visit to see the little folk of Babbacombe and receive a visit from THHN Memory Maker Man. From the six finalists, three winners will be chosen and their design will go into production for use as next year’s THHN Christmas cards. The three winners will also win some ToysRUs vouchers, courtesy of our terrific friends at Teddy Mountain. Letters and information about this exciting competition have been sent to headteachers at all the local primary schools and if your child’s school is not getting involved but your child would like to take part please just e-mail roger@thhn.co.uk who will get all the info over to you. We’ve already received some fantastic, festive artwork and are looking forward to seeing many more flood in. As well as looking for competitors and volunteers we’re also after sponsors. We have some great packages available with some excellent PR opportunities for businesses, groups or individuals. If you think you might be interested please e-mail brian@thhn.co.uk who will tell you all about what’s on offer, with packages starting at just £100. Competitors can take part in either a 53 mile ultra marathon or a 23 mile coastal run or walk. We’ve planned a fabulous route taking in some spectacular scenery ending on the beautiful Babbacombe Downs where we will have a race village, live music and all sorts of goings-on. If you’ve got your 2015 diary already then make sure you put a big star on Saturday 5 September. The cracking Cockington Christmas Caper is coming up soon on Saturday 13 December. As many of you know, it’s a stunning location and we’ll be there on the day with our stand enjoying the bar, BBQ, Christmas carols and festive atmosphere. If you’re taking part, we’ll see you there but if not, pop along anyway, say hello and enjoy the day with us. The truly inspirational Bright Green Star Man who invited us to be part of the Christmas Lights Switch on in Torquay. Our stand raised £307.50. We wish him all the very best in his endeavours and thank him so much for including us. To find out more about the vital Bright Green Star Campaign visit the Facebook page at www.facebook.com/brightgreenstars. Huge thanks too to all our volunteers who helped out on the day. The boys from Vain Train Gym and Leisure Wear who presented Luke with 70 pairs of children’s shorts to give to children who come on a THHN holiday – what a lovely gift. 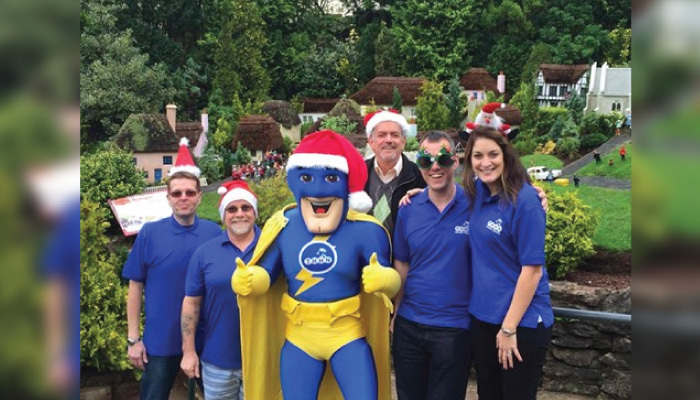 Babbacombe Model Village and Teddy Mountain for their incredible support of our Christmas card competition. Everyone who helped give a lovely family a holiday at our wonderful Memory Maker Caravan at the Finlake Holiday Park. The Rotary Club of Buckfastleigh who not only invited Luke to be guest speaker at one of their meetings but also presented him with a cheque for £1500, money they raised in the summer after Buckfast Abbey Warden, Geoff Pring, nominated THHN to benefit from funds raised by their summer art exhibition. Torquay Golf Club and Club Captain, Dave Needham, for making THHN their nominated charity for 2014 and raising £1060 for us. The lovely people at Swift Carpets & Flooring who are providing all the carpets for our new children’s charity shop and offices in St Marychurch Precinct, completely free of charge. Wow. David Hanbury and the team at Hanbury’s for being our first City to Sea 53 sponsor. We’ve just had some great new leaflets printed to help spread the word about what we do. If you have a collecting tin or anywhere that you think we could put some please let us know and we’ll get a supply over to you. E-mail us at enquiries@thhn.co.uk Thank you.